The Thriving Students program trains New Mexico educators in evidence-based approaches to fostering student success, inclusion, and achievement. Our trainings and consultations specialize in assisting educators to address the needs of students who have serious social, emotional, and academic challenges. By accessing trauma-informed strategies and the tools of positive psychology/education, educators are empowered to shift their paradigms and approach these challenges in the most constructive and meaningful way. Change the trajectory of students experiencing failure and exclusionto success and inclusion. Empower educators, families, and students to promote positive change within their school. 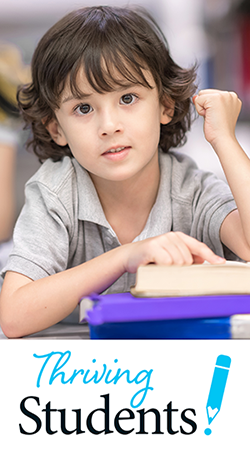 Raise optimism and provide trauma-informed behavioral interventions for struggling students. Create interventions that promote inclusion. Support school safety and create connection between educators, families, and students. Nurture a culture of optimism that makes any school a great place to learn and work. Kids do well when they are given the opportunity to do well. With enough support, and sensitive, intelligent engagement, even the most troubled students can show remarkable improvement. Learn how a student who is acting out is actually displaying their current stressors, fears, or traumatic history. Instead of judging and punishing, Thriving Students empowers educators to more fully embrace the situation, applying trauma-informed tools and techniques that do not reinforce the negative beliefs being exhibited. We adopt an optimistic stance, and create a positive feedback loop where students can gradually overcome chronic triggers, problematic beliefs, and negative self-perceptions. Our goal is to shift students from a cycle of failure and exclusion to one of success and inclusion. Some students respond appropriately to traditional discipline. Traumatized students may be impacted in a very different way—reinforcing beliefs that they are worthless, or unwanted. Thriving Students advocates a patient, adaptive, whatever-it-takes attitude. Our trainings help educators to decipher problem behavior, understand the deeper significance of such events, and outline constructive engagement. We learn how to recognize the meaning behind different types of disruptions, how to avoid becoming triggered oneself, and intervention strategies that actually work. Southwest Family Institute provides the Thriving Students program to schools in Albuquerque, Santa Fe, and surrounding areas. Our program is tailored to the unique needs of each school, and is comprised of in-person trainings, consultations, and telephone follow-ups as needed. We begin with a staff-wide presentation that lays a foundation of trauma-informed care and positive education. Next, we help to establish a committee of school staff, a core team, to receive in-depth training on the delivery of the Thriving Students model. By having their very own team, schools can become proficient in delivering the model an ongoing basis, helping teachers, positively impacting challenging students, shifting paradigms, informing interventions, and working to improve the school climate. A dedicated consultant is responsible for training the core team, providing ongoing consultation, coaching, and support as they implement the Thriving Students model.